A general contractor had a project at a 500 kv Substation near Nashville, Tennessee where they needed to dig a long trench in order to run new electrical conduit. It was unknown what utilities they might encounter while excavating the new trench. Prior to proceeding, they contacted GPRS of Tennessee to gain the information needed to safely excavate so they didn’t compromise anything existing during the construction process. 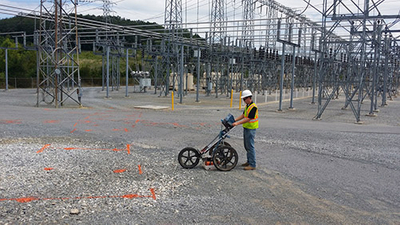 Utilizing GPR reduces risk and cost, promotes a safe work environment, and provides non-destructive testing by locating materials such as concrete, plastic, metal, steel and pavement. Our client base includes hospitals, universities, surveyors, engineers, homeowners, contractors, environmentalists, and excavators. For your next subsurface project in Nashville, Tennessee, contact Regional Manager, Matt Johnson, at (615) 418-4023 or matt.johnson@gprsinc.com.